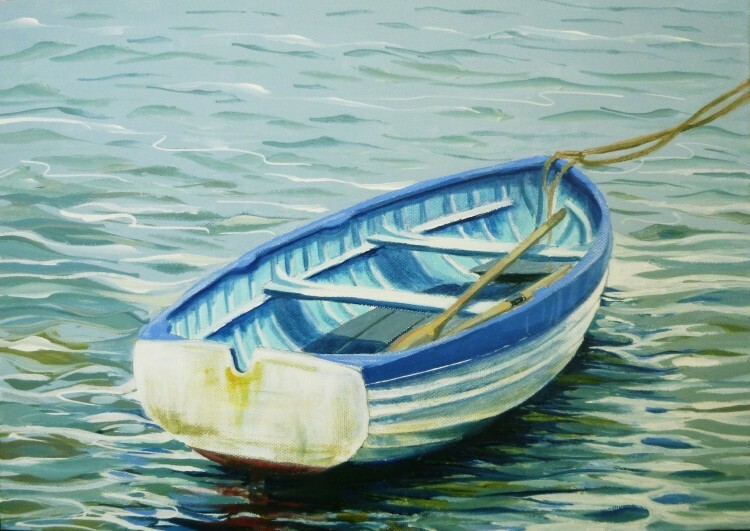 My latest dinghy painting, just finished this afternoon, I’ve called ‘Dinghy with Oars’ – I’m running out of Dinghy titles! Jacqueline, at the Geedon Gallery, said to me a little while ago, that I should have started with ‘Essex Dinghy I’, ‘Essex Dinghy II’, and so on. If I had I think I would now be up to Essex Dinghy XVIII, by now! Unfortunately, though, I started giving them names in the beginning, so I’ve got to keep thinking them up yet more names . . . . Tomorrow I will hear how one of my other dinghies has fared in the Royal Academy Summer Exhibition first round of selection. If it gets through I need to get it framed quickly, to take it up to the RA at the end of March, as the second round is a ‘real’ viewing – the first round is only digital. I’m keeping everything crossed! I took all those paintings that will be exhibited in the Lexden Arts Festival to the framers on Monday, and I’m especially looking forward to seeing what ‘From my February garden’ looks like, as I’ve had it framed in a new way. It will be in a white box frame, with glass, mounted on white board, with a kind of foam board behind it, so the general effect is that the painting appears to be floating between the backboard and the glass. It might be really effective, or it might be an expensive mistake! We shall see . . . I’ve just made a start on my next garden painting, ‘From my March garden’, which will feature narcissi and hellebores. We’ve been having such wonderful spring weather here, really sunny and warm since last Saturday, that everything in the garden is coming on with remarkable speed.